Ohioans For Concealed Carry Discussion Forums • View topic - Any mountain bikers? I've been going stir-crazy... I bought a 29er in December (Motobecane Fantom 29 X7 from BikesDirect), and have only put about 50 miles on it. I rode a section of the Little Miami trail (Corwin to Fort Ancient and back) and have gone on a few late night city rides. It seems like most of the trails around SW Ohio are either closed for clean up or are too sloppy to ride (courtesy to other riders). I can't wait until Mitchell Memorial opens back up, and have been wanting to check out Caesar Creek and Momba. Post up what you're riding! Here's a quick pic of my Motobecane 29er... Only things I've swapped out were the pedals (Wellgo MG-1) and the grips (Ergon GP2). I'd like to get a shorter stem, a new seat and a setback seatpost. I used to, but have been out of it for a some years. Boy, it looks like the wheels got bigger! We rode 26". Where is your AR rack? We used to ride Trek's all over East Fork Lake. Had the Camelbak water bottles and all! I still ride on 2 wheels, but with an 800cc motor these days. "Awesome" is code word for CC in my house. Cuts down on the kids asking, loudly, in public, if I am in possession of anything that goes bang. I ride a 1996 Cannondale M200LE, I bought new. 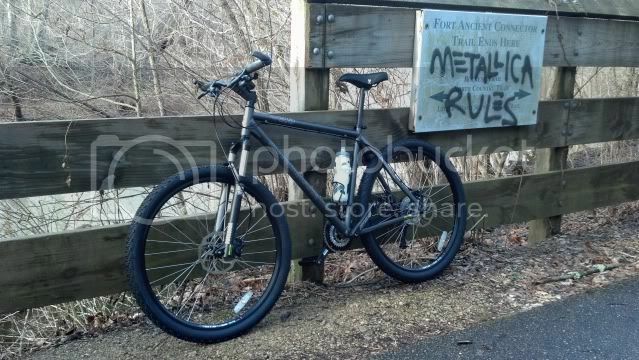 I ride out at Quail Hollow a little bit, and some of the unauthorized trails along the towpath. Haven't been out much the last couple years. I did spend some time in Maryland and there was some great trails down there. Now you got me wanting to pull my bike down, and ride. Cruiser wrote: I used to, but have been out of it for a some years. Boy, it looks like the wheels got bigger! We rode 26". Same here. I've still got my 26" from WAAAY back in the day. It's pretty beat, but I still ride it around in town (since the in town roads are much too rough to ride the road bike on). I am not a mountain biker, but I do ride the bike trail between Dayton/Xenia/Yellow Springs/and I think it ends in Milford(? ), but have only been about 10 miles South of Corwin. I need to get out and start biking again. I have a hybrid with I really like. Too old for mountain bikes and road bikes (how can you SIT on that seat??) It's a very enjoyable trail and a few hills, but nothing too serious. Not a lot of roads to cross (unless you go through Xenia or Springfield). It's great exercise and I do need more of that! I do carry when I am on the trails and you will see the occasional odd looking fellow (especially as you near Yellow Springs!) They made great use of the old railroads and it's nice to ride a smooth, relatively flat trail. I live just west of Corwin, and have only rode the section between Corwin and Fort Ancient (19.8 miles round trip) and it was a very nice ride. I'd like to take it north next time, from Corwin to Xenia. Finally got the scratch and ordered a Trek Too Fuel 8. Its a 100/100 travel bike, which for where I live is just fine and dandy, without giving up much speed to a hard tail on climbs. Just waiting for it to ship. 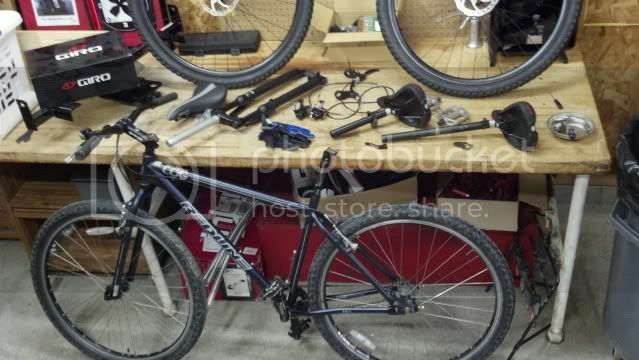 First real mountain bike, first full squish, first air shock, first tubeless, etc etc. I’ll order a dropper post in a few weeks/months, and might do a 1x conversion on it later this year.